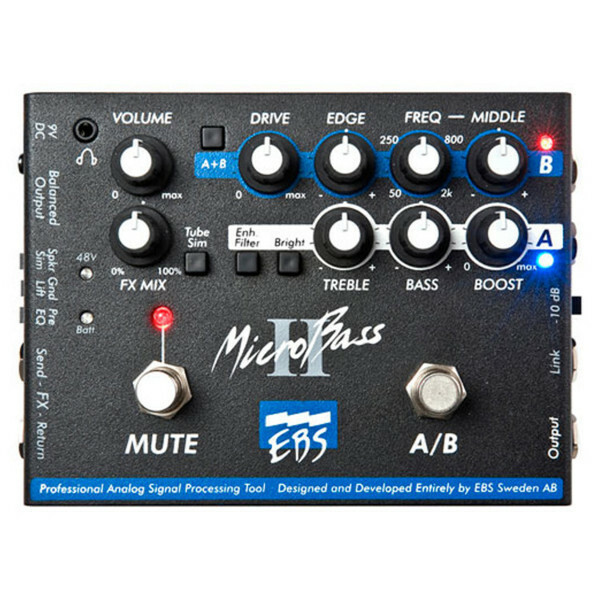 This EBS MicroBass II boasts a selection of uses, whether it's an active direct box, a one or two channel preamp, instrument switcher or blender, it's all possible with this handy piece of gear from EBS. Thanks to the two channels, there's plenty of scope for shaping your sound. You can go from from high end solid-state types to distorted timbres, using the awarded tube emulation circuitry found in the EBS range of professional bass heads. The MicroBass II also has an incorporated effects loop, giving you added flexibility for connecting to other effect pedals. Furthermore you can mix in an external audio source such as a CD player, which works great for rehearsal use or just for playing along. The MicroBass II boasts fantastic flexibility on stage or in the studio, thanks to its balanced output with speaker simulator option. Use the footswitches to control mute and channel operation/switching. There's a headphone output, low battery indicator, link and master outputs, bass, "sweepable" midrange, treble, bright and edge filters, drive and effects mix controls, so there's plenty to have fun and experiment with.